Step 2 In a large mixing bowl, whisk the sauce ingredients together. Add the green beans, tomatoes, and onions and toss to coat with the sauce (you can do this in batches if the bowl is too small). Step 3 With a large slotted spoon or spatula, transfer the vegetables to a large baking sheet (21 x 15 x 1 inch baking sheet, for example). Keep the vegetables to one side or one half of the baking sheet and make sure they are spread out in one layer. Step 4 Now, add the halibut fillet strips to the remaining sauce, toss to coat. Transfer the halibut fillet to the baking sheet next to the vegetables and pour any remaining sauce on top. Step 5 Lightly sprinkle the halibut and vegetables with a little seasoned salt. Step 6 Bake in the 450 degrees F heated oven for 15 minutes. Then transfer the baking sheet to the top oven rack and broil for another 3-5 minutes, watching carefully. The cherry tomatoes should begin to pop under the broiler. Step 7 When ready, remove the baked halibut and vegetables from the oven. Serve immediately. A If you’re looking to add a side, we recommend this Lebanese rice. 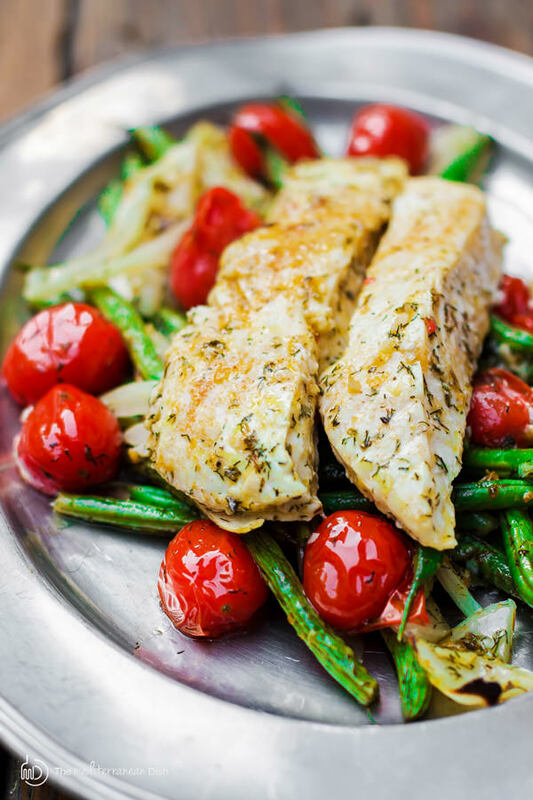 Make this easy halibut recipe with green beans and cherry tomatoes in 30 minutes or less! It bakes in a flavorful Mediterranean-style sauce with olive oil, lemon juice, dill weed and lots of garlic. Take a look at the step-by-step photos below.